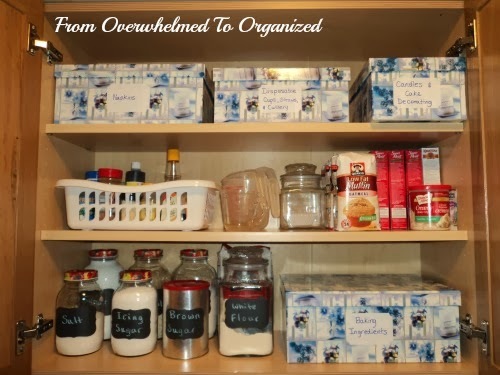 This month I'm organizing my kitchen and as I do I'm sharing tips to help you organize your kitchen. 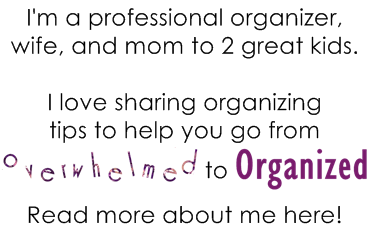 I've been focusing on organizing kitchen drawers so far in this series, but now I'm switching gears and looking at organizing kitchen cupboards. 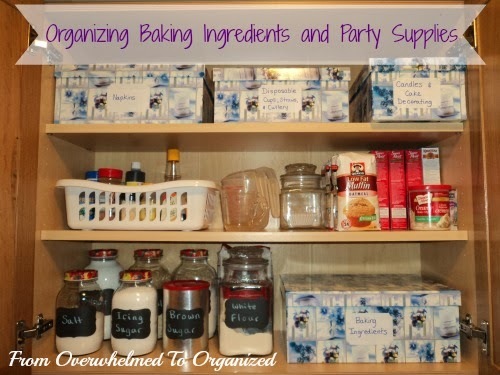 Today I'm showing you how to organize baking ingredients and party supplies. 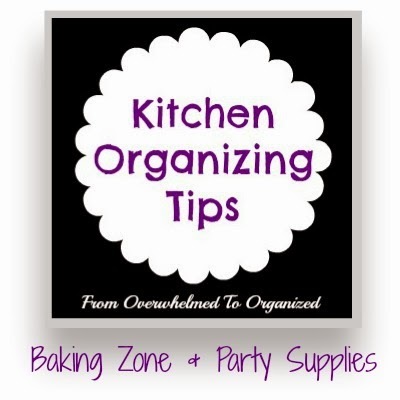 Today I'm going to share my party supplies zone and my baking zone. Here's a picture of the cupboard I use for these two zones. It's right above my utensil drawer and my pots and pans drawers. This cupboard used to be a total disaster! One of those "I'm afraid to open the cupboard door because a bunch of stuff will fall on my head" kind of cupboards. A couple years ago I'd had enough so I sorted items into these decorative boxes. Which brings me to the next tip. On the top shelf I have all our party supplies. It's my party supplies zone. The three boxes on this shelf contain everything we need when we have a special occasion. 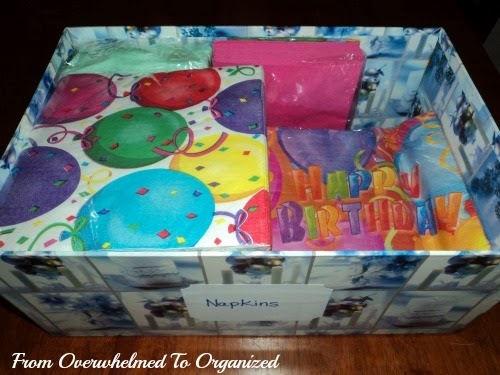 The first box contains all our napkins. These were one of the worst culprits for falling off the shelf because they slide around when stacked. 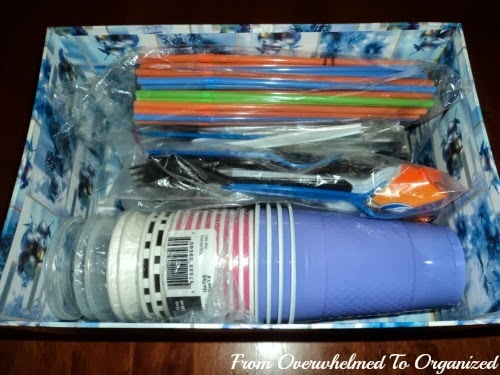 I also have a box for all our disposable cups, cultery, and straws. Within this box, I have separate zipper bags for forks, knives, and spoons, as well as a bag of straws. The cups are stacked to reduce the amount of space they take. We don't use disposable products very often, but when we do, I can find what I need in this box. This works well for us. Also for parties, I have a decorative box with candles and cake decorating supplies. 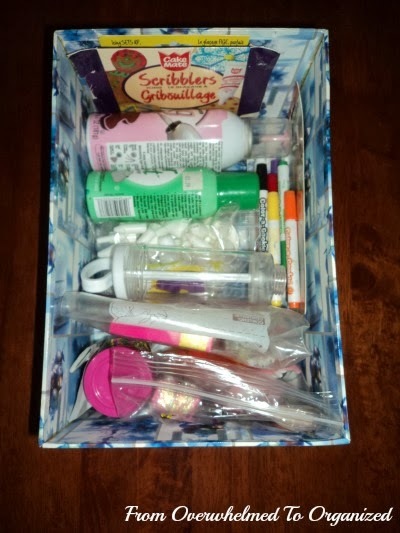 This box has sprinkles, cake toppers, candles, icing tips, etc. in this box and it's easy to pull this down when we're decorating a cake for a birthday party or other special occasion. Having all these items together make the cake-decorating process very simple. And that's my party supplies zone! The middle and bottom shelves are my baking zone. First on the middle shelf, I have this basket. It contains seasonings, extracts, food colouring, toothpicks, etc. that are all used for baking. Since we don't use a lot of spices in our cooking I've also included them in this basket. 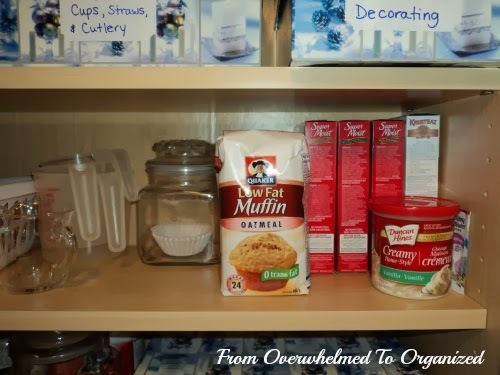 Because this cupboard is right above the counter that we do most of our food preparation and baking, it's convenient to have these items close by. Also on the middle shelf I have our measuring cups, cupcake liners, and baking mixes. My cupcake liners are in a glass canister that has a nice wide mouth so they are easy to get in and out. It looks like I need to restock our liners! It usually looks much prettier than it does right now. I just put our leftover Fall and Halloween liners away and I haven't opened my Christmas bins yet to add my Christmas cupcake liners. On the bottom shelf, I have all my baking ingredients. First I have another matching decorative box which holds all my smaller baking ingredients. This is much easier to keep organized than having all these ingredients floating around on my cupboard shelf. When I need any of them I just pull the box down and take out what I need. Often I need several ingredients at once so I just keep the whole box on the counter while I'm baking. I also keep some of my overflow bags in this box (for the ingredients I keep in the jars). Speaking of my jars... here's a close-up picture. I love these jars! Do you remember when I got these jars and pretty lids for free on Freecycle? They add a nice pop of colour to my cupboards and keep everything uniform, which makes it feel more organized. Following this tip will help you see how much you have left of each ingredient, so you never have to run to the store in the middle of baking your favourite recipe. You can't see the jars in the back row, but they contain sugar, oatmeal, and whole wheat flour. The white flour is in another glass canister with a wide mouth. I prefer to scoop out my flour and this makes it easier to do that. Sadly I don't have another one in this set for my whole wheat flour. The brown sugar container is my one exception to this tip. I use an old Slimfast can to store my brown sugar because it keeps it soft. I've tried several ways of doing this unsuccessfully, but keeping it inside a bag in this can has worked the best for me. I was going to put some pretty paper around the can, but I actually kind of like the silver and it keeps the simple look of the rest of the cabinet. My rolled oats are getting low so there's a new bag ready to go when the jar is empty. I often have a bag or two of flour hiding behind a jar too. There's space to reorganize the jars a bit as needed. I thought I'd be able to remember which ingredient is in each jar, so at first I didn't put labels on them. But we had to throw out a whole batch of crepe batter when my poor hubby mixed up the salt and the sugar. So out came the labels! 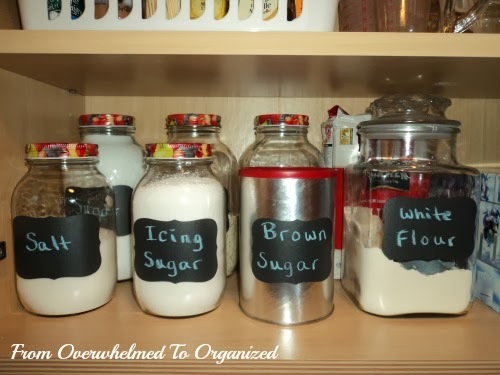 I used Martha Stewart chalk labels (like I used for my pantry) so I can change them if needed. I also labeled each of the decorative boxes in this cupboard so we can easily see what is in each one. I don't plan to change the contents of these boxes very often so I used regular labels. If I ever need to change these labels I can just use a new one. I put off doing the labels for this cupboard for a long time. I've seen such beautiful labels on Pinterest and I wanted to make pretty ones for this cupboard too. But after the crepe incident, I knew I had to just make labels. Any labels. Even peel-and-stick, hand-printed labels. Done is better than perfect. 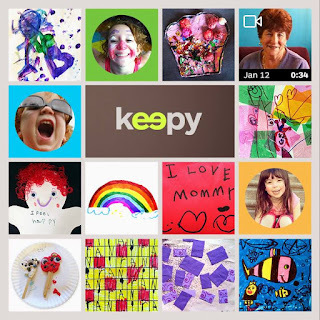 Some people put off getting organized because they want everything to be perfect. 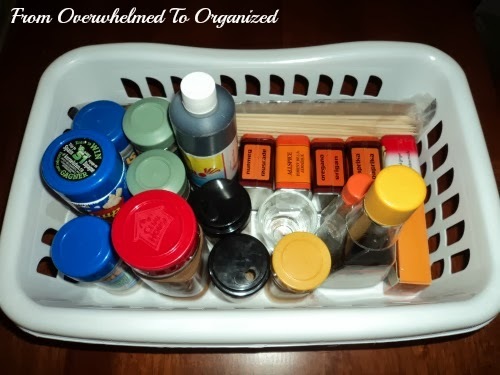 But please don't let your desire or need for perfectionism to get in the way of living in an organized home. 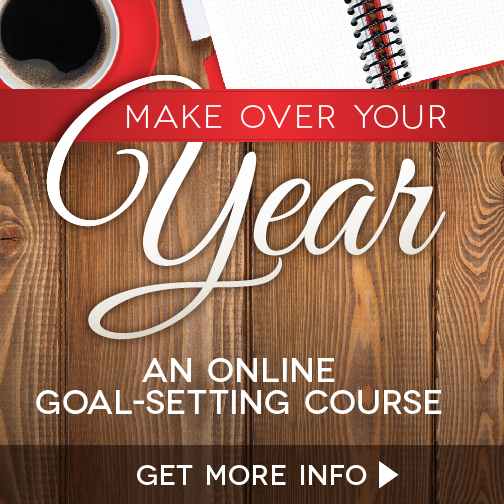 It's better to be mostly organized than wait to start organizing because you don't have the time or materials to do it as perfectly as you want. I love how organized this cupboard is! It really makes baking and throwing parties easy. If your baking ingredients and party supplies need organizing, implement one or more of these kitchen organizing tips to simplify your life and reduce your time in the kitchen. 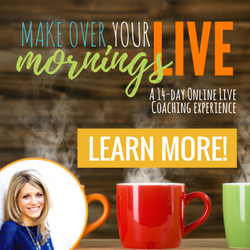 Stay tuned throughout the month as I continue to show you my kitchen and share tips to help you organize yours. 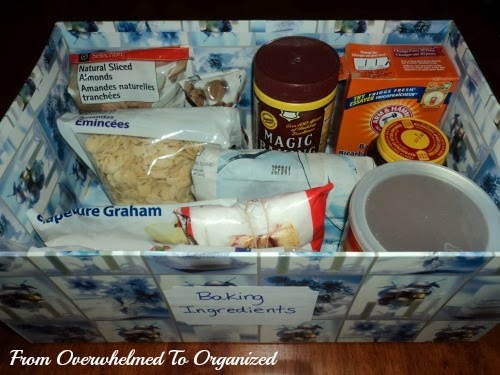 How do you organize your baking ingredients and supplies? How about your party supplies? What are your favourite containers and labels? Uh oh. I think I might need to start organizing my kitchen cabinets. I have a similar cabinet with spices and baking parts and candles and it's nowhere near as pretty as yours is above. I think maybe a small basket or two might really help it out. Thanks! Mine wasn't always pretty Melissa... or organized. But it's incredible how big a difference these boxes and baskets have made in keeping it organized. Good luck organizing your kitchen cabinets! You have organized good kitchen and your kitchen organizing tips are very useful. 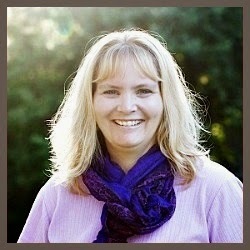 I like your blog Thanks for sharing.